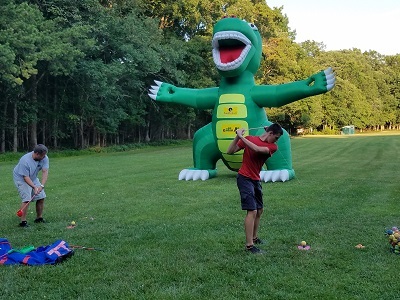 See if you can hit golf balls through the hands, feet, or mouth of Golfzilla! Saturday, April 20 from 9 a.m.-3 p.m. Play basketball in our climate controlled, indoor gymnasium! Our lobby table games including air hockey and ping pong will be available as well. Ages 17 and under must be accompanied by an adult at all times. The cost is $5 per person per day. Saturday, April 20 from 12-3 p.m.
See if you can hit golf balls through the hands, feet, or mouth of Golfzilla. All are welcome. This is a non-instructional offering, however, if needed we will teach you the very basics of the golf swing. All equipment is provided. Weather permitting. FREE! Saturday, April 20 from 1-3 p.m. Hear music from yesteryear played on an accordion. FREE! Saturday & Sunday, April 20 & 21 from 1-4 p.m.
See the 19th century gristmill in action. Weekend demonstrations run through November. FREE! Explore one of our Environmental Centers – Manasquan Reservoir Environmental Center, Howell and Huber Woods Environmental Center, Middletown. Hike, bike or walk our 139 miles of trails. Step back in time at Historic Longstreet Farm, Holmdel or Historic Walnford, Upper Freehold. Visit the greenhouse at Deep Cut Gardens, Middletown. Go on an expedition with our Safari Backpacks. Our Spring and Summer Camps & Swim Lessons issues of the Parks and Programs Guide are available online and in most county parks. Registration is underway for both issues and is accepted online; by phone at 732-842-4000, ext. 1; or in person at Park System Headquarters in Thompson Park, Lincroft. For more information on any of these activities or parks, call 732-842-4000, ext. 4312, between 10 a.m.-4 p.m. daily. Our outdoor offerings are weather dependent. Before heading out, please call 732-842-4000, ext. 6, to see if the activity you're interested in has been cancelled due to inclement weather. It is understood and agreed that park visitors and participants in Monmouth County Park System programs, activities, and events may have their names and pictures used, without fee, in broadcast, telecast, and print media accounts for promotional and publicity purposes.